One of my favorite summer dishes is the sweet corn agnolotti at Graffiato. There is nothing better than fresh, sweet, crunchy summer corn. 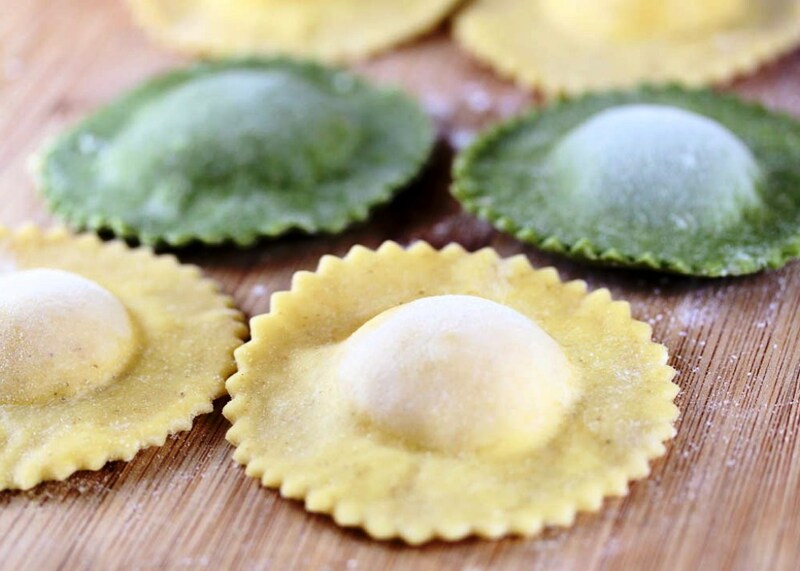 I got an abundance of super fresh corn ears last week in my Green Grocer DC box, and I thought that ravioli filling would be the perfect recipe to use them in. By the way, if you are in the DC area I highly encourage you to give Green Grocer DC a try. It is a really convenient way to get local, seasonal produce delivered to your home. The only problem with my plan to make corn ravioli was that I don’t have a pasta maker. Luckily, it is now easy to find fresh pasta sheets at grocery stores. 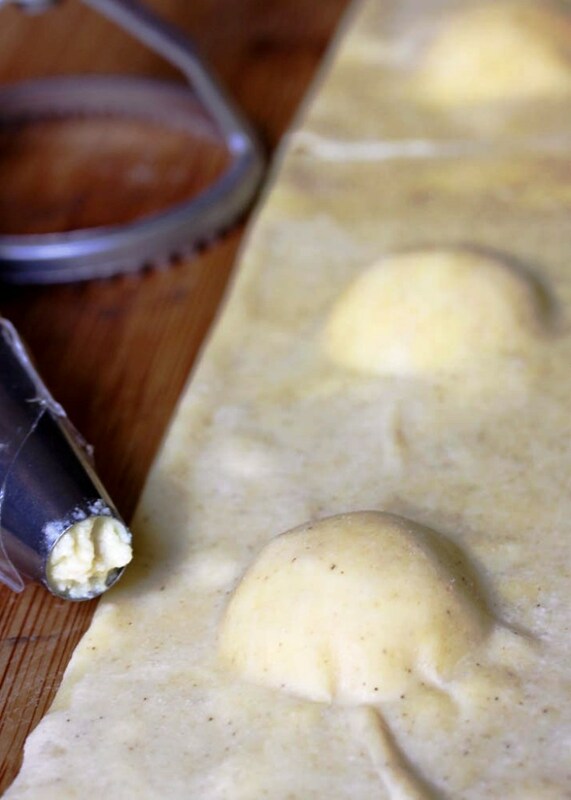 If you have a pasta maker and a recipe for egg pasta dough, you can make your own pasta sheets to make the ravioli. But purchasing them is a huge time saver. I was pleasantly surprised with the results. 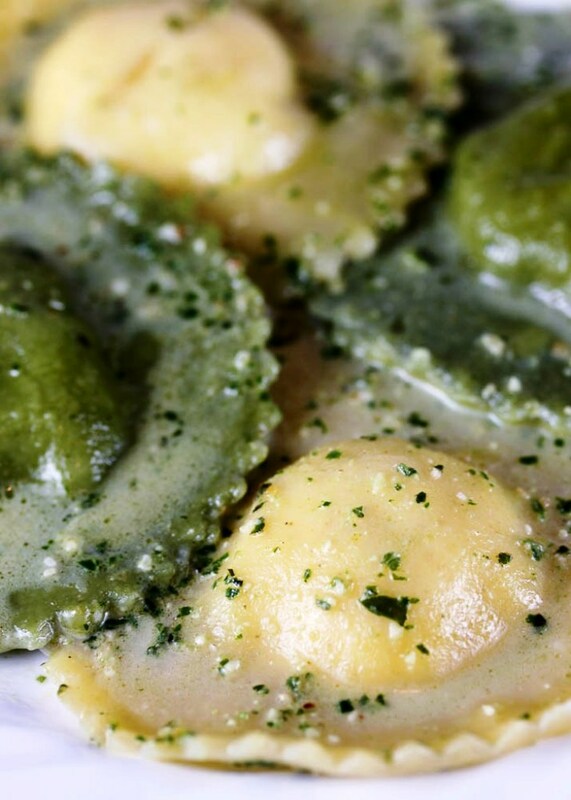 These ravioli are filled with the lightest ricotta and corn filling. The sauce is light, with just a hint of cream, and the nuttiness from the pine nuts and parmesan in the pesto. Again, here is another chance to save some time. Just get your favorite brand of pesto at the grocery store. 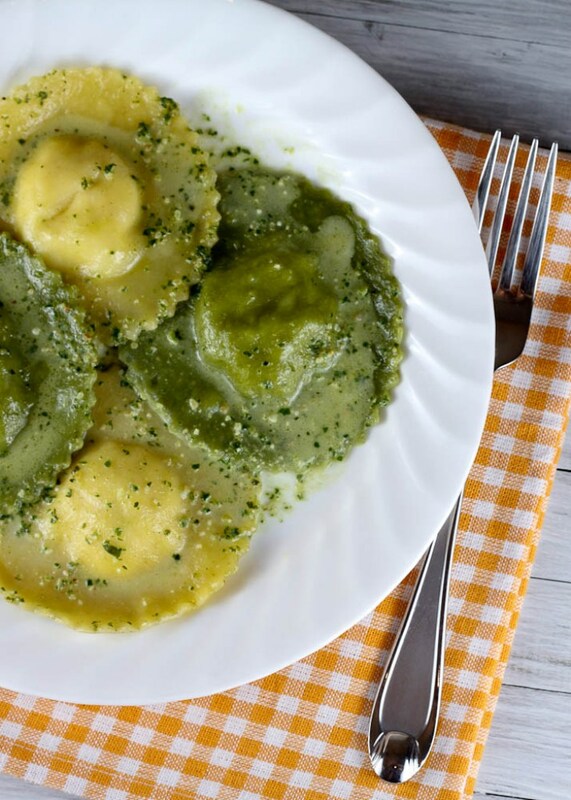 I plan on making a few more batches of these ravioli, and will keep them in the freezer to put together a last-minute and delicious summer dish. 1. In a medium skillet over medium-high heat, add corn kernels, heavy cream, sugar, salt, and pepper. Cook until most of the liquid has evaporated. Let cool. 2. 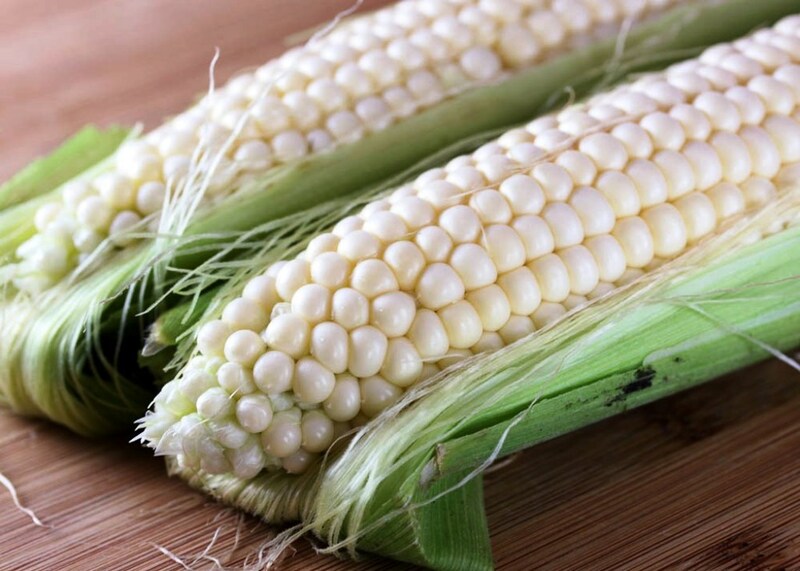 Mix cooked corn with ricotta, parmesan, and the egg until all ingredients are evenly incorporated. Refrigerate for 15-30 minutes for filling to set. 3. Lightly flour a large wood board or counter. Run one pasta sheet under warm water for about 10 seconds on each side. Let the water drain away from the pasta sheet. Place pasta sheet on floured surface. Blot the top of the pasta sheet with a paper towel. Place a tablespoon of filling every 3.5 inches on the pasta sheet. Brush the pasta all around the filling with egg wash. Run another pasta sheet under warm water on each side, and place this on top of your filling. Cut the ravioli and make sure all the ravioli are all well sealed. The round ravioli stamp that I used is 3 inches. You can also cut the ravioli with a cookie cutter, a pizza cutter, or a knife. 4. Line a small tray with parchment paper and flour lightly. Place the raviolis on it, without letting the edges touch, and cover well with plastic wrap. Freeze for 30 minutes before cooking. If you want to transfer them to a zip top bag to cook at another time, freeze them for 1 hour. 5. Bring a large pot of salted water to a boil. Cook raviolis until they float to the top, about 3-5 minutes. 6. Prepare the sauce while the raviolis are cooking. 7. In a large skillet, add chicken broth, and heavy cream, bring to a simmer over high heat. Add the pesto to the broth right before adding the cooked raviolis. Simmer raviolis in broth for a couple of minutes, until the sauce reduces and thickens a bit. Serve. Corn ravioli?? Why, how did you know that I have two beautiful ears of farmer’s market corn in my crisper right this very second? I think I will try this out with wonton wrappers for the pasta component. Hooray! I’m definitely making this tonight! It’ll be my first time making ravioli from scratch so I’m really looking forward to it. Thanks for the recipe!